Does the thought of sitting around a warm bonfire on a cold night, roasting marshmallows and sharing stories with friends appeal to you? Ever had fresh caught fish, wild game or store bought steaks grilled over an open fire? If you have an appropriate space, the land owners permission, and a weekend in mind, a fire pit would make a great project! 1. Find a construction site with concrete sidewalk, driveway or parking lot demolition taking place. Do not enter a commercial site, or work area, without at least an OSHA approved Hard Hat! Best to know who's in charge first, rather than wandering around inquiring in a potentially dangerous area. Ask a laborer to point the site Supervisor out to you. 2. Locate the site Supervisor/Foreman and ask permission to remove about 500 lbs/227kg of this waste material. They will usually comply, since it means less work for their crew and less bulk in the roll-off dumpster. Get right to work, quick and professional, collecting chunks of concrete no more than about 12in/30cm in diameter. Don't forget smaller ones to fill in the gaps! 3. Use your shovels and wheelbarrow to remove any dead grass, twigs, leaves and firewood from your chosen fire pit site. A 4ft/122cm in diameter circle makes good fire pit, for most purposes. Clear an additional 10ft/3m diameter buffer zone, or fire break, of flammable material to prevent any brush fires! 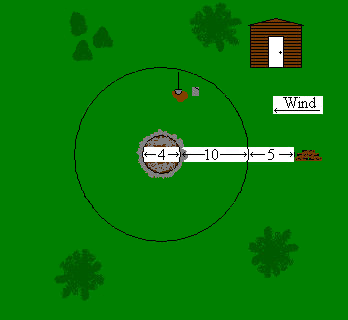 Drive a stake in the center, with 12ft/3.66m of rope to find the outside diameter. 4. Mark 2ft/61cm on the rope to find the inside diameter. Dig a hole 4ft/122cm wide x 12in/30cm deep. 5. Line the pit with concrete chunks and ring the rim, placing them closely together with no gaps, to complete your fire pit. * Good friends make short work of this project! * Locate your fire pit no less than 15ft/4.57m and down wind from any flammable structures, including your firewood. * Mature pine cones make excellent tinder! * Be sure there is no flammable material above your pit, especially pine branches. * Check with the local Fire Department to be sure there are no burn bans or restrictions in effect, before lighting any fires. * Keep a shovel, some of the dirt removed and a bucket of water close to the pit. * Never build or try to maintain a fire in strong gusting wind. * Be sure your fire is completely extinguished when you are done with it. * In areas with a high Peat content, use the bottom section of a steel drum as a liner for your pit to prevent underground fires.